The weather may not have been on our side, but with so many rainy days this summer, eventually you just throw caution to the wind and do outdoor activities anyway. 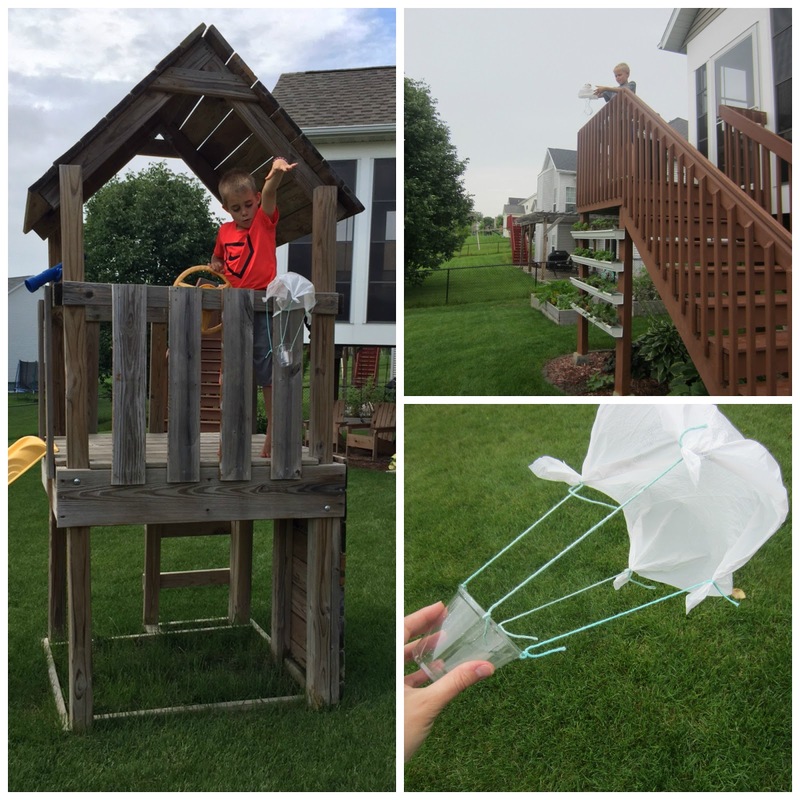 And so it was the day we made DIY parachutes. Making these was simple. We had all the supplies we needed around the house. How to Make It First we punched holes in the top of the plastic cups, just under the rim. You'll need to punch four holes equal distance apart (approximately). Next we cut one plastic kitchen garbage sack into a 14-inch square. Since we made two parachutes, we measured and cut the bag with it flattened (i.e. two plies) so we had two squares with only a few cuts. Now we cut four 14-inch lengths of string for each parachute. Our oldest son gathered a corner of the plastic square and tied one length of string to it, leaving only a small tail. He repeated this with the other four corners. Now all that was left to do was to go to a high place and drop those puppies. My sons perched on the landing of our deck and later our yard's play set. They LOVED watching them gracefully float to the ground. My oldest son tucked the parachute in the cup and dropped it to see what would happen. It sank to the ground with lightning speed. That's gravity for ya! 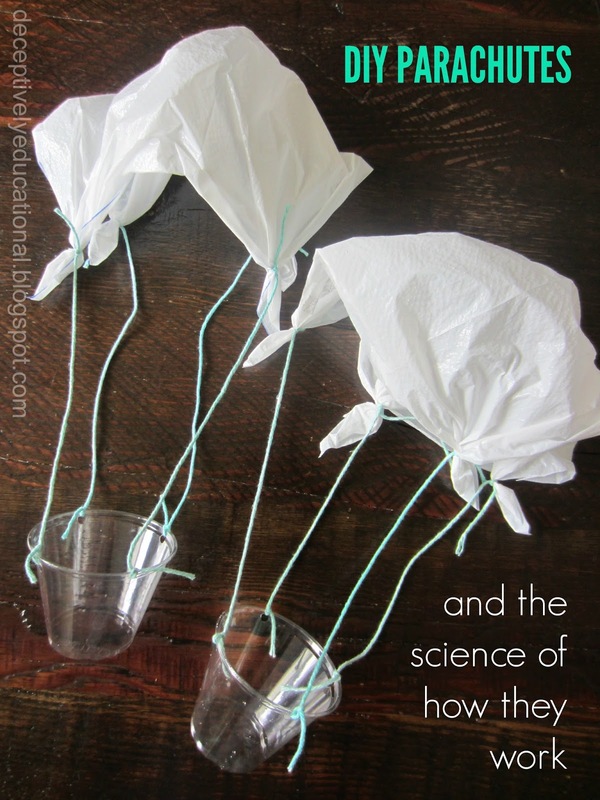 How Does a Parachute Work The cup glides slowly down thanks to something known as air resistance (or drag). When air gets under it, the plastic parachute fans out for maximum coverage; this air resistance slows the fall of the object tremendously. 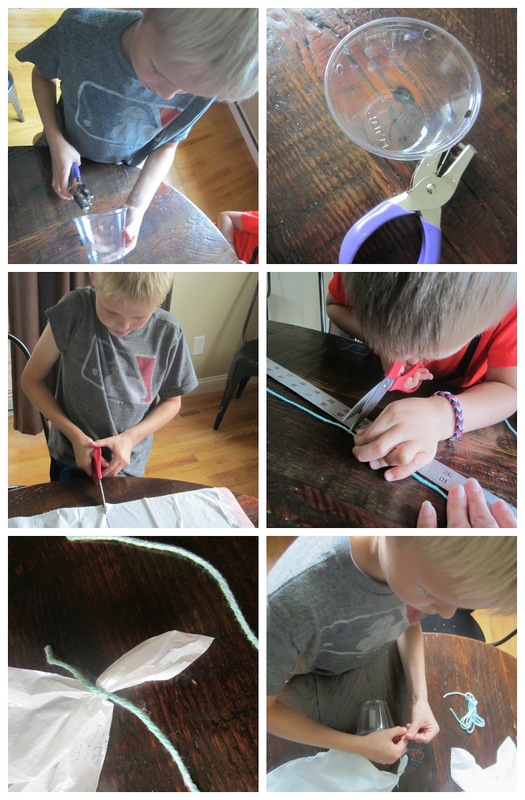 This great activity came from Patricia A. Staino's wonderful book Magic Moments: Super Science with Your Kids. Check it out!